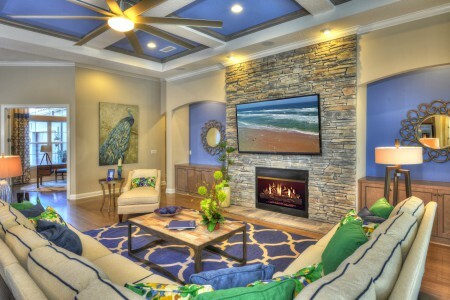 Sisler Johnston Interior Design has completed the interior design of the Biltmore II model by ICI Homes at Nocatee’s Twenty Mile. The firm has a long history of designing for ICI Homes. The Biltmore II is a single-family home with 4,258 square feet of living space. Sisler Johnston selected a color palette featuring Lapis Lazuili, Sherwin Williams’ color of the year, along with emerald green, lime green aqua, greige and linen to complement the home’s transitional design style. The furnishings are modern transitional in washed greige tones. The flooring is hardwood grey hickory, the cabinets are greige wash and the countertops are granite in warm grey shades. The home’s impressive double-door entry leads to a spacious foyer that flows into a formal dining area and great room that opens to a spectacular covered outdoor living area. The great room has a boxed coffered ceiling and is furnished with a large sectional sofa in linen with dark lapis contrast cording and adorned with accent pillows. Window treatment accents flow from the great room’s 12-foot ceiling. 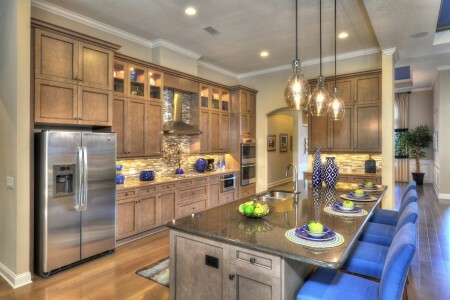 The gourmet kitchen includes a center island and sunny casual breakfast nook that seats six. The kitchen cabinetry features stacked upper glass door cabinets to showcase accent pieces. The secluded owners’ suite has its own vestibule and sitting area and features a beamed ceiling and spacious custom-designed closets. The lavish master bath has a large jetted tub, walk-in shower and an adjacent fitness area with a stunning window view. The home also has three generous-sized bedrooms on the first floor. One bedroom features a Legos theme for a boy and includes a mural and custom-made Legos dresser. Another bedroom is designed for a music and dance enthusiast and includes a mirrored ballet bar while a third bedroom, designed for a college student majoring in building construction at a nearby university, highlights construction photographs and hardhat accents. The second floor bonus space offers endless possibilities and is designed as a game room with a boating theme. The upstairs also has a second master suite furnished with a king-sized bedroom set and a large bath. The Biltmore II has abundant storage including a tucked away “Florida basement” closet for holiday décor and luggage. 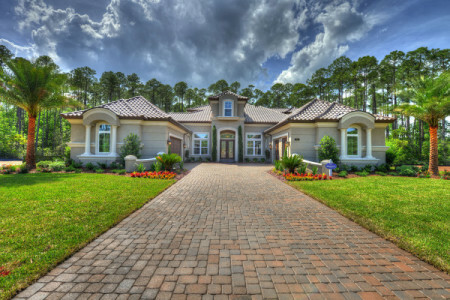 The Biltmore II is one of numerous ICI home designs available at Twenty Mile at Nocatee, a new neighborhood exuding Old Florida grace and charm.